The City of the Damned: New Orleans book has another problem, one that is unique to the Crescent City and the Gulf Coast: Hurricane Katrina. On sale mere weeks before Katrina devastated New Orleans, a good many bits of local color and specific geographical information in CotD:NO are now woefully obsolete. To be fair, this is likely to only be a real issue to people who reside in or know and love the city well. Besides the horrific death and destruction toll it took on real-life residents of the city, White Wolf had to be cursing their timing that something as seemingly safe as a reference guide to a fictional version of a major US city becomes partially obsolete literally overnight. New Orleans, as reckoned in the World of Darkness, is a city under the sway of an ancient, Lancaea Sanctum Prince named Augusto Vidal. Because of this, the city is bursting with tensions – political, spiritual and economic. Vidal rules the city with an iron hand, and tolerates the presence of the Circle of the Crone – the covenant supported by one of his major rivals for power, the Nosferatu elder Baron Cimitiere – but only barely. The city is also largely carved up into territories already; newcomers may have trouble feeding without stepping on the toes of others. This is precisely the way Prince Vidal wants it: the local Kindred are (mostly) beholden to him for their very existence. It helps him maintain control over the Big Easy – control that has lasted for more than 200 years. The information in this book expands on the data provided in the final chapter of the Vampire: the Requiem core book, adding many new minor characters, a handful of locations, and more background information plus a short, original adventure to introduce the new kids in town to New Orleans. If I have any complaints about this book – and they would be minor ones to be sure – it’s that the book seems a bit scattered; organization appears to be an afterthought here. It’s challenging to find the stats for the power players in the city, and it shouldn’t be so. This is not a new concept utilized for this book alone; it has been applied to a number of the WoD books I’ve purchased, and I find it mildly annoying. Rather than have a chapter where all characters’ stat blocs are collected, they are placed in scattered clumps. Sometimes there seems to be a reason to this dispersal – putting all of one particular faction together, for example – but usually the groupings are less tightly organized. 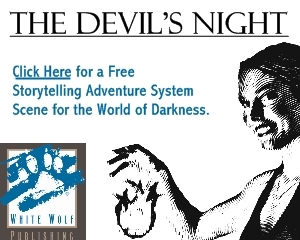 Also, I wish White Wolf had taken the same road with this book as they did with the World of Darkness: Chicago tome. There are clearly far more forces at work in the Big Easy than just vampires, but other types of supernatural creatures rate only a passing mention in sidebars. Keeping in mind what I mentioned earlier – that these guidebooks tend to appeal to fewer players by virtue of being primarily intended for GMs – it seems natural to make them as easy as possible to integrate into any type of WoD campaign, whether Vampire, Werewolf, Mage, or something else. All that aside, City of the Damned: New Orleans is exactly what a guide to a specific setting should be; intriguing, full of mystery and potential, and offering intoxicating glimpses of another place. At an MSRP of $26.99 for a print copy (less for a PDF download), CotD:NO is well worth the money for the setting material alone.